I learned last night that I would have today, Saturday, completely open. Most of the family is headed to Maine for a major cross-country race. Our oldest child is pre-occupied with homework and friends. So, I had most of the day to do whatever I wanted. Wow, what a rare and awesome treat. What a gift. As the father of a large family, my weekends usually are filled with kids’ events or family-oriented activities. Grocery shopping. Cooking. Laundry. Driving my children to a plethora of activities. I know some fathers who often drive their kids around all weekend for hockey practices and tournaments. Thankfully, none of our children plays hockey. So, a completely open day is very rare for parents. I started to ponder the possibilities. Should I see a movie, given that it is raining? Catch up on chores? Binge-stream Netflix? I decided to fly fish at a local river, “only” an hour’s drive away. I didn’t have very high hopes, as I’ve not fished it, it runs by a major road, and is completely pounded by anglers. I instead was looking forward to being outside and enjoying the autumn scenery. After I pulled onto a dirt road and parked near the river, I came out of the car just as someone and his dog walked up the trail. His name is Ernie, as I found out later, and he is a car mechanic. He fishes and he hunts, and we talked about those topics. After a while, we shook hands, he wished me luck, and he was on his way. I have to say that fly fishing has led me to meet so many amazing and friendly people, most of whom don’t run in the tech/VC/college-educated circles in which I spend nearly all of my time. Ernie drove a really old pick-up truck. His dog is cool. They left to drive to Cabela’s, a huge sporting goods store, in Connecticut. It started to rain cold rain as I walked down to the river. I was bundled up in a lot of layers. I started hooking fish right away. Over a few hours, I landed seven fish. Most were good-sized. 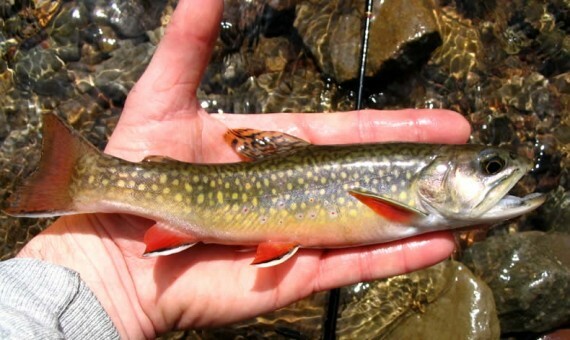 My favorite, though, was a small brook trout, as it was wild and not stocked. I’ve posted a photo up top from the Web (I don’t bring my iPhone fishing with me since I lost one in the water a few years ago). I reached my car just as it really started to pour, all smiles. I didn’t care that I was cold. I didn’t care that I was wet. I caught trout, met Ernie, and spent a few hours outdoors. And, the cross country race? It was the league championships. Our child placed in the Top 10 amongst a huge pack of runners. Woot!